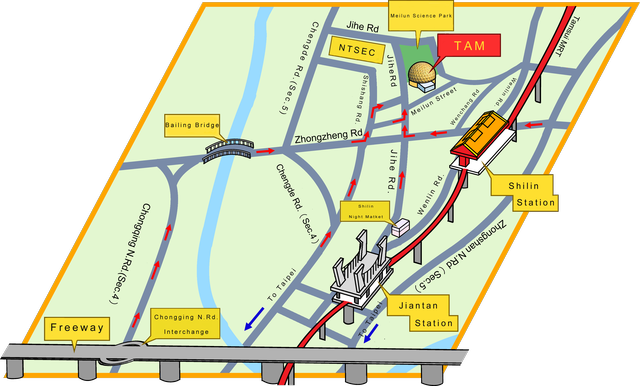 Visitors can take buses stopping at Shilin District Office, Yangming Senior High School, Shilin Motor Vehicles Supervision Station, Shilin Junior High School, MRT Shihlin Station or Jiantan Station. Saturday: 8:00A.M. to 21:00 P.M.
b. 30 to 60 minutes-NTD30. (3) Fee: Pay at the exit ticket booth with Cash or EasyCard. (4)Ticket: Once tickets get lost, the fee will be charged from 8:00A.M. (5) Parking: No vehicles shall enter into the lot while the museum is closed. For those cars already in the lot, shall be driven out. For further information, please contact the security office or call 28314551 ext 510. (7) Receipt: Please inform the parking office in advance if you need a receipt. (8) Responsibility: The parking lot is for parking only, any belongings loss is self-responsible.